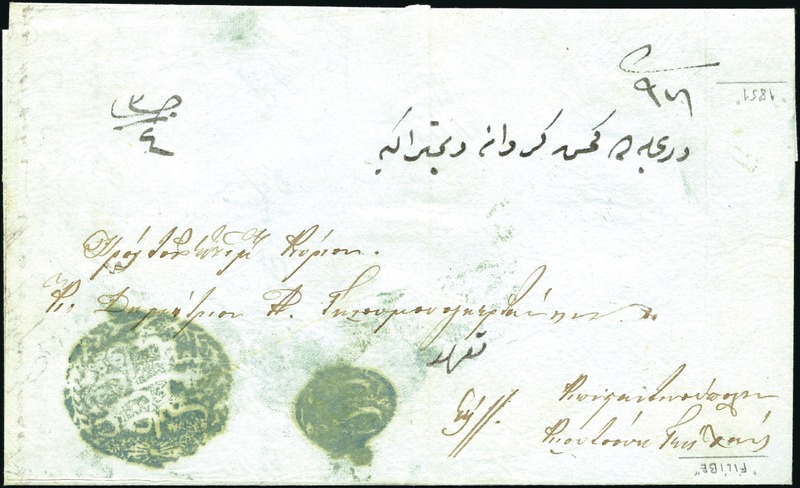 Plovdiv-Filibe : 1851 Registered cover from Plovdiv to Constantinople showing fine all Arabic negative “An Canib Posta-i Filibe 256” handstamp in green (Coles & Walker fig. 16) and, alongside, all Arabic small negative “Taahhüt olunmu#tur = has been registered’ seal. Weight 3 Dirhem / postal charge 4 piastres in manuscript at top. If you have a strong interest in a specific lot and would like more information or further scans, click the below button and send us a message. Important: don’t forget to mention the lot number(s).